Brushing teeth is not on the top of most children’s “to do” list. Getting them to brush their hair or brush their teeth can be like using spaghetti for bookends. 1. Brush your teeth at the same time as the child brushes his. Let him stand on a stool next to you and mimic what you do. Sometimes being grown up like mom and dad is all it takes to get the child to brush his teeth without a battle. 2. Invest in a toothbrush that lights up or plays music. These are designed to go for one to two minutes so it encourages the brushing for the length of time necessary for real cleaning. 3. 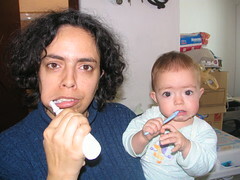 Start brushing teeth when the child is very young. As soon as the children begin getting teeth then they are old enough to get their teeth brushed, even if you do it with just a soft brush with no toothpaste in the beginning. It gets the children used to having the toothbrush in their mouth. 4. If you don’t have one of the self-timing toothbrushes, then use a kitchen timer. Set it for two minutes and see who can brush their teeth for the full two minutes. 5. Make it a game. Let them get a certain bedtime story or song (or maybe get TWO stories) if they can brush all their teeth. Get them to count each tooth as they brush it. 6. Get them involved in the brushing process. You can ease the tooth brushing battle by letting your children pick their own toothbrushes and even their own toothpaste. The more control they feel they have then the easier it will be to get them to cooperate. 7. Be consistent in getting the children to brush their teeth. Make it something that happens at the same time every single night. Experts say that if you can repeat an action for 21 days in a row then you will have set a habit. 8. Be watchful of the children when they first begin brushing their teeth on their own. Stay in the room during the process, and make suggestions if they are needed. As they get more consistent with their brushing then start leaving them alone for the whole process. Instead of fighting your children to get their teeth brushed you can find creative ways to change their grooming habits. As their habits change and they begin to adjust, you will see the tooth brushing battle ease up or just end altogether.